“It really makes me sad that the Bible says that women should obey their husbands. It’s like we’re second class citizens. It makes me feel like I wish I was never born. My husband is a good guy and I usually willingly obey him but what if he didn’t want me to to something that I feel is the right thing to do?” This was a comment I just received on one of my posts written long ago. Unfortunately, it’s not an uncommon sentiment from women when taught on the subject of submission. Therefore, they rebel against their husbands even if they are married to good men. They discount submission for the “what if…” just as this woman did. Oh, he might ask her to not do something that she “feels” is right. Do you notice the word “feel”? It’s not based upon the Word of God but upon her feelings and “he might…” She and many women will use any reason or arguments as to why they shouldn’t submit to their husbands. Men are for our protection, women, in more than one way. God created them to be our protectors as they are not usually as easily deceived as we are. Women were created to be soft, trusting, and nurturing in order to be home and raise children. Women coming out from under the authority of men has caused chaos! I cringe every time I see women as policemen, firefighters, or in the military. They are dressed as men and act masculine but they aren’t men! They have been deceived into thinking that they can do a man’s job as good as men can but they can’t. Men are the ones who are to be in the protective roles in culture. This doesn’t make us second class citizens. It makes us women who should be thankful for their protection. Instead of trying to figure out all of the ways we can get out of submitting to our husbands, let’s begin submitting to them in obedience to the Lord. Let’s allow them to lead us and our families in the way they want to lead even if we don’t “feel” they are leading in the right way. We may be wrong, you know! Even as Sara obeyed Abraham, calling him lord: whose daughters ye are, as long as ye do well, and are not afraid with any amazement. They are only in the eyes of the so called “feminists” who believe that anyone who takes on anything other than a man’s role is second class and less than as a person. They devalue the female role in belittle it as oppression…. The breakdown of our civic education is not so far-gone that most of us despise the idea of democracy; there’s a sort of carried-over respect that is nevertheless eroding, even as cultural respect for religion has eroded. But this residual respect shows why using terminology such as “second-class citizens” is so effective: It implies that women are being denied rights. These “rights” are ever-expanding; a woman’s personal autonomy is such a sacred right that it trumps another being’s right to life. Conversely, our responsibilities as citizens are shrinking; women who lightly dismiss their husbands from the home are not penalized for this move, but awarded child support and alimony. Moreover, a term such as “citizen” makes men and women fungible. Two moms=just as good as a mom and dad! Two dads=just as good as a mom and dad! Transmen and transwomen are just men and women who experience a great deal of undeserved prejudice! Oh I love this post Lori. 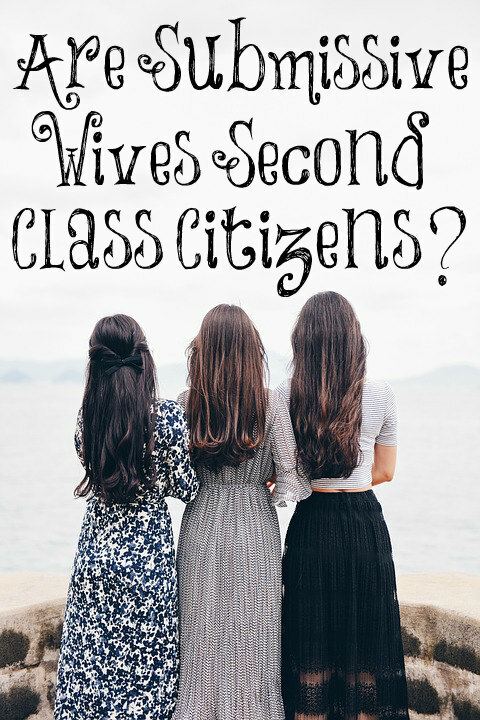 I don’t consider myself second class because I joyfully( though not always easy) submit to my husband’s authority. He is not bossy or a bully or takes advantage of his role. Those women who fail to obey God’s command in the Bible will sadly have to face the consequences on judgement day. Alimony is for either spouse that has been married to another for more than 10 years (in most states) and the other spouse makes more money. It is granted during a divorce. It is not gendered specific. Child support is what either parent owes for the sake of their child. It is not gendered specific. The adverb(s) “usually willingly” are the true revealing parts of her statement(s). What she means is (and I’m speaking from experience), I will accept that God wants me to submit to my husband, when I can see that he is correct: When, according to my judgment of his actions, he is “being a good guy.” God’s command doesn’t make me feel like a second class person … as long as my husband is choosing what I deem as … ‘right’. The problem is that she’s blaming her rebellion on God’s command to submit, instead of on her own heart. She’s blaming God for the command but wording it as though it was her husband that wrote it. Another problem is that, what she’s describing: submission-because-I-agree … isn’t actually “submission” … it is agreement. They are not the same thing. Great insight, Robyn. You are right! She is deciding what submission looks like and acting accordingly. God asks us to submit to our husbands. But he doesn’t assume us to be door matts and he doesn’t regard us as the lesser for it. The point, a point which feminism cannot accept is that God made men and woman different, and for different roles. A wife should be the keeper at home under the loving and Godly protection and (yes) authority of her husband. I suspect calling traditional wives that is the old playground bully tactic. It makes the feminists feel superior while trying to hide their own insecurities. The way Jesus treated women in the Bible absolutely shows that we are not second-class citizens! The way my husband treasures me and takes care of me certainly proves I am not a second-class citizen – he treats me like I’m highly valuable! I’ve also found, the more submissive I am, the more cherished he makes me feel! Obeying God always brings blessing. You do realize that it’s easy to cherish a person when they agree and follow every thing you say? You see someone’s true love and true colours through how they treat you when you don’t agree to do exactly what they want to do. When I got married, I had no intention of being a submissive wife. I was a modern woman. There was no “obey” in our wedding vows and the very idea of me ever obeying my husband, or being submissive to him made me laugh! No way was that ever happening!! So yes, I got to know my husband’s true colours right from the start. Even when I did whatever I wanted (still do, to a point) my man treasured me. I would never have married a man who didn’t. It’s only been the past few years that I’ve started to become submissive, and I’ve noticed the difference it is making. It just works better, when we follow God’s will. Women are actually the second class of human that was created. All the animals and their mates were created at the same time. However, then the man was made first, in God’s image, and then secondly the woman was made from a part of the man, and made for the man, to be the man’s glory, to be a helper to the man, who is God’s glory. So, the wife should see to it that she reverence her husband, who is the image of God, and submit to him in every lawful thing, as unto the Lord Himself. It really is that simple. Try it! Your husband will naturally love you for it, and glory in you fulfilling your God given role, that God gave you to your man to perform. Your husband will cherish you as he cherishes his own flesh, if in fact you are as loyal and obedient as his own body is in obeying the head. For no man ever hated his own flesh. However it is tougher to love a woman who is a hindrance to a man’s plans, who mainly helps themselves, and has competing purposes and dreams, who has been blinded to see the purpose and image and glory of God in their man, and acts accordingly with irreverence. God’s way works best. Repent of your own way. Deny yourself. Return to God’s path. Pick up your cross and follow Christ by following your husband who is the image of Christ in your life, even as you image Christ’s church. Your reward will be both great and eternal. Teach other women to virtuously honor God’s image and glory by honoring your own husband in all your words and actions. And your husband’s heart will come to safely trust in you and he will praise you and your children will grow up to call you blessed. God told you all of that in His word. Go and sin no more. Wives should submit to their husbands but the Lord shall always have the highest authority. God’s words should be followed over the words of your husband. In case your husband is asking you to do something that is against God’s teaching, then I believe the right thing to do is to follow God. God commands that you obey your husband. And you refuse your husband because he asks you to defy God. Aren’t you defying God no matter what you do? No R, what Ana said is exactly correct. A wife is to submit to and obey her husband in everything EXCEPT, if her husband asks her to do something that God has clearly said not to do. In that case, Gods instruction supersedes her husbands and it is illogical to think that she could be defying God while obeying him at the same time. Same principle applies in the military, a subordinate is to obey all LAWFUL orders given by a superior and if they do not obey a lawful order they can be prosecuted and punished for disobedience. But when it comes to UNLAWFUL orders, not only should an unlawful order NOT be obeyed, obeying such an order can also result in criminal prosecution and punishment. God knew what He was doing when He made us in His image! There is literally nothing in the Bible that suggests submissive women are second class citizens! It is only women who don’t want to be submissive, who believe this. I don’t believe wives have to submit to evil, eg if your husband is mistreating you or the children, that is an exception to the principle of submission and I believe a loving God has no issue with a woman putting her and her childrens’ safety first in those type of instances. Sometimes of course, this mistreatment can be quite subtle eg- if a husband forbids his sick wife/child to see a doctor or his depressed wife/child to see a counsellor or therapist, because he is ashamed it will make him look bad then I guess this could be included in that exception. I think ultimately cases like this are between the wife and God. Generally speaking though if your husband is not asking you to submit to something which can cause physical or psychological harm, then you should submit. I have been married 25 years. My husband and I are both Christians and I teach women studies about being a godly wife. Respect, submission, serving. I am a homemaker and my husband has a stressful job and works six days a week. I take of the home laundry cooking etc. I serve my husband. The other night we were both relaxing on the couch I was starting to get sleepy. He asked me to get him a blanket from another chair across the room. I started to get up and he said your so easy. I said what do you want me to say get up and get it your self? He said yes. The he asked me to pass him something from the table behind us immediately after and i said get up and get it yourself. He smiled and said yes that’s right. I’m confused. All my married life I learned to be submissive and respectful. That this is what men need and want. So what is going on here? What am I supposed to do. I have worked so hard to be kind and gentle and submissive. He did have a working mother who was pretty strong. and has female bosses. I was a feminist and God is changing me. I feel if I responded like that I would be going against the Lord. Confused! What do you think is going on here and how should I respond. I posted this in another article but no response please give me some help. Keep being kind, gentle, and submissive towards him, Faith, for this is what God asks of you. Hi Lori, I hate that the lady that posted the comment about feeling like a second class citizen is so insecure about following God’s word and plan for us and putting her trust in her husband to lead and protect her. A good and strong husband should always lead his wife in the right direction. I know there are some husbands out there that do not treat their wives the way they should, so I can only speak from my experience. In my marriage, submission and obedience are not options up for negotiation, and I don’t want them to be. That’s just something I don’t worry about. I put my faith in my husband and in the Lord. My husband protects me, adores me, teaches me and loves me more than I could ever measure. Why would I not want to submit to him and obey him in everything? As I mentioned in other posts, I’m sure feminists don’t care for me. I am proud that I am totally dependent on my husband taking care of me and it shows every day. I am great at getting pregnant, having and raising kids, keeping my house and serving and obeying my husband. That’s all I’ve ever known. Outside of that, I’m a mess! Lori, the story you told about you getting a new cell phone and being gullible, that’s me on almost a daily basis, so don’t feel bad. The only difference is you did what you thought was right when your husband was out of town, I would have gone crying to my dad or one of my sons to “fix it” for me. Happens alot! I’m called a “ditzy little housewife” all the time and I totally agree and don’t mind it a bit because my hub takes care of me and keeps me pointed in the right direction – home where I belong – and I love him for it! Nobody is a second class citizen in God’s kingdom! God is no respecter of person, we are all loved and cherished by Him absolutely. Does this mean our roles in the Kingdom are the same? No. Men and women have different roles, equal but different. Just like in the Body we all have different gifts- eg some have the gift of preaching, some prophesying, some being pastors, some intercessors etc None more important than another, no one is expendable. I do wonder whether many women have a false concept of what submission means? I know I did. I used to think it meant a woman had to put up with brutality and unkindness. Then I heard someone in church preach both sides- that a wife must submit and a husband must love her. Both the wife and husband need to do thier God ordained roles for the marriage to work, otherwise there is chaos and heartache. I do not believe submission means being a doormat. I believe it means a wife is to respect her husband and not be contentious, quarrelsome or nagging, but to bear with him in love and defer to him in most decisions (picking battles wisely). It could mean more than that but for sure I know it does at least mean that. A wife can set boundaries and question things but in most decisions, a husband should have the final say. I think many married couples quarrel about things which are not worth quarreling about eg which restaruant to eat at, where to go on holiday, whether to paint the bathroom blue or green etc It surel does no harm for a wife to let her husband make the final decision on these things, even if she hates the new bathroom etc! Of course, there are bigger more serious decisions eg whether to vaccinate the child, which church to attend etc I guess that is where it can be harder for a wife to submit. I am guessing though, Biblicaly a wife should submit if her husband’s decision is not going to cause harm to her or the children or go against God’s commands or will.